Start at Sydney's Circular Quay. Step off your train, bus or ferry and walk west. The ferry jetties should be on your right. Turn into Circular Quay West, going north. The water should be on your right. Walk past the Museum of Contemporary Art. You'll see Cadman's Cottage on your left on Circular Quay West. Step into Cadman's Cottage. This is one of the oldest surviving buildings in Australia, built in 1816 as barracks to house the coxswain and crew of the Governor of New South Wales and was home to the last government coxswain, John Cadman. The National Parks and Wildlife Service Information Centre is now located here. Open daily, it is a valuable source of information about national parks near Sydney. It has a George St entrance at 110 George St. 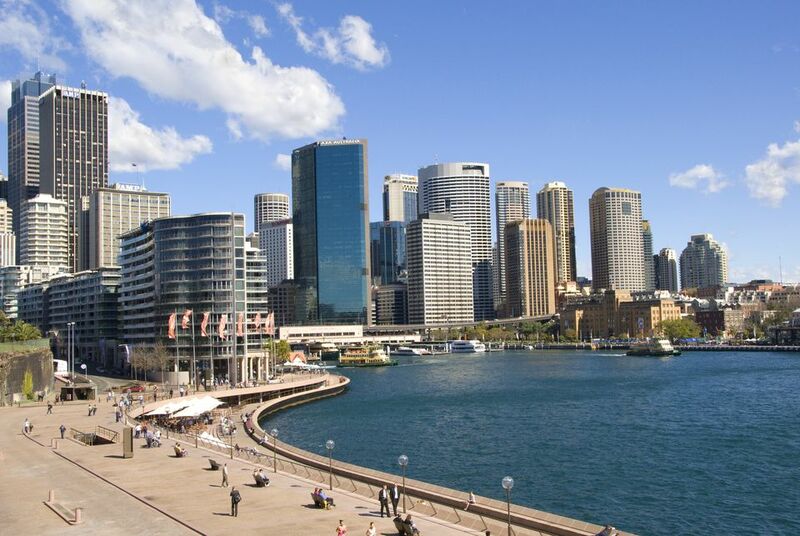 This is the general area of the first Sydney settlement established by Captain Arthur Phillip who commanded the First Fleet which reached Sydney Cove in January 1788. Captain Phillip became the first governor of New South Wales. In the picture are warehouses built in colonial times (which have now been converted into usable office space, shops, and restaurants). Across the street from the row of warehouses is the Overseas Passenger Terminal for ocean-going ships. You can see the Sydney Harbour Bridge ahead. Locate steps going up to George St and walk up to the area's main street. Walk to the George and Argyle Sts junction, and head west into Argyle St. On your right, at the corner of Playfair St, you will find The Rocks Centre. The Sydney Visitor Centre is on Level 1, where you'll find much valuable information on Sydney (and New South Wales) attractions. Take the escalator if coming in from Argyle St or the stairs from Playfair St. From the Sydney Visitor Centre, continue walking along Argyle St to the Argyle Cut. Walk into Garrison Church at the corner of Argyle St and Lower Fort Rd. The church, the colony's first military church, was built in 1840 for the soldiers to attend services. It was enlarged in 1855 to accommodate 600 people. It is still used today and is generally open from 9.30am to 5pm. Regimental plaques hang along interior walls to remind churchgoers of the church's military association... From the church, continue northeast through Lower Fort Rd. Step into the Hero of Waterloo Hotel. This and the nearby Lord Nelson Hotel vie for the distinction of being Sydney's oldest surviving pubs. Built in 1843 by convict labor for stonemason George Paton, the Hero of Waterloo is said to be a genuinely Irish pub. Have a middy or two. As you walk toward the end of Lower Fort Rd, notice the terrace houses built in colonial times along the road to Dawes Point Park where the Sydney Harbour Bridge begins and arches across the water to North Sydney. These terrace houses are typical of housing in The Rocks. Notice the network of steel buttressing the Sydney Harbour Bridge. You'll see people walking along the steel supports as they head towards the very arc of the top of the bridge in the popular visitor drawcard, Bridgeclimb. The Sydney Harbour Bridge was completed in 1932 and is as much a Sydney icon as the Sydney Opera House. If it's a weekend, walk through the Rocks Market, which occupies a closed-off portion of George St from Dawes Point Park down to Hickson Rd. The market may be opened at night on special occasions. The Rocks Market is as good a place as any to buy small pieces of art, knickknacks and souvenirs. The Rocks Market is a Foodies Market on Fridays from 10am to 4pm. On weekends (Saturday and Sunday) the Rocks Market is open from 10am to 5pm.